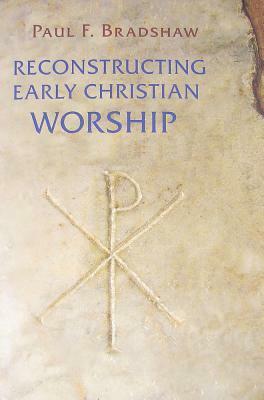 Reconstructing Early Christian Worship, by Paul F. Bradshaw. Collegeville, MN: Liturgical Press, 2010. 151 pp. $19.95. Those who seek to look into the early Christian period’s worship in detail would do well to consult Paul Bradshaw’s book Reconstructing Early Christian Worship. Bradshaw, Professor of Liturgy at the University of Notre Dame and priest-vicar of Westminster Abbey, writes this book as an attempt to delve into various specific aspects of early Christian worship and challenge conventional understandings where he finds those understandings to be faulty (vii). While it is not a comprehensive look at all aspects of Christian worship, or even those aspects that would most interest evangelical Christians today, it does not claim to be such, and in the end it adequately accomplishes Bradshaw’s stated goal. The book is organized in three main sections dealing with the three aspects of worship Bradshaw has chosen to approach: Eucharist, Baptism, and Prayer. Each section is divided into three chapters that narrow Bradshaw’s focus to specific aspects of each of those areas of worship. Discussing Baptism, Bradshaw focuses on catechumens and when they received the “gospel” in relation to their baptism, what a profession of faith would have been like and how it worked into the baptismal progression, and various types of anointing that took place in relation to baptism, whether it be pre- or post-baptismal anointing. In the third section of the book, Prayer, Bradshaw deals with the development of daily prayer, the role of the psalms, and penitential prayer in the early Christian period. He frequently comes to conclusions differing with those of mainstream twentieth-century thought, finding, for example, that the “cathedral” tradition of the daily offices was not, in fact, the sole authentic expression of early Christian daily prayer, but was merely one of several divergent streams of tradition that later converged. Since the book is a compilation of a number of various articles and works by the author at different times, it does not end with a unifying, summarizing conclusion but concludes at the moment the final chapter on penitential prayer ends. The book is strong for its intended purpose, which is to delve deeply into very specific aspects of early Christian worship and, if the evidence requires it, overturn commonly held scholarly beliefs about the period. Bradshaw relies heavily on primary sources, something of a requirement for a work on this subject, but still impressive. He even, at times, finds opportunity to question mainstream opinions on some of the primary sources themselves, such as a source’s authorship (47–50). Bradshaw’s in-depth analysis and treatment of a variety of primary sources is a major strength of the book. The author acknowledges the importance of studying early Christian worship, highlighted by his inclusion of modern applications at the end of each of his chapters, but he does not fall into the trap of assigning too much weight to such early practices. He makes the excellent point that “early Christians were just as capable of theological and liturgical distortions as their modern counterparts” (37). Bradshaw’s arguments in the book are largely strong and well-thought out, though he does at times accuse other scholars of jumping to unwarranted conclusions or assumptions (42) while making one or two of his own (57). As this reviewer first approached the book as if it were a general overview of the main aspects of early Christian worship, it was frequently tempting to accuse the book of focusing too much on specific peripheral issues and ignoring the bigger picture. However, that is not what the book is meant to do, and it handily meets its actual stated goals. Bradshaw appears to approach his subject from the perspective of a Catholic scholar who is delving into the finer points of contention that he might have with other such scholars, focusing on specific rites like penitential prayer or the anointing of those who were baptized. Reconstructing Early Christian Worship is a great book for those who are studying the finer details of early Christian worship that Bradshaw addresses. Being so narrowly focused in scope and so scholarly in language, the book seems to be aimed toward the author’s contemporaries and fellow Catholic scholars, adding new thought and analysis to the field. As such, the book is not very appropriate for, or accessible to, the average evangelical reader who is interested in aspects of early Christian worship that are related to points of contention today, such as whether people in that period baptized through immersion or pouring, or what types of songs they might have sung in their worship. As for its stated purpose, the book succeeds resoundingly, proving itself a valuable contribution to the field of research into early Christian worship. 1 Pings/Trackbacks for "Reconstructing Early Christian Worship, by Paul F. Bradshaw"